The combination of heat, the sea air, the smoke from the olive wood fire and the salted sardine being slowly grilled to perfection. A smell that is omnipresent on most beaches in and around the Costa del Sol. Even the sound is captivating, the slow spitting of the fish oil, the cracking of the wood, the continual stoking of the wood embers and, of course, the conversation that invariably goes with it. The humble sardine is the unwitting star of many a Spanish summer. The grilled sardine is not exclusive to Malaga and is enjoyed throughout most of Spain. On the Atlantic/Cadiz side, they are known as "sardinadas," in Granada, "Moraga" and in seafood loving Galicia, as "al aspetu." But nowhere is the grilled sardine more popular and emblematic than in and around the Costa del Sol. The Espeto de Sardinas has become an institution and is considered by many as Malagueño as the Biznaga. Grilling fish over open fires has been around in Malaga since Pheonician times. The Pheonicians and later the Romans, took advantage of their larger fishing boats and often grilled themselves a quick meal while still at sea, or just as they returned. The small fire was built within the boat itself and the fish was carefully grilled over the hot embers. 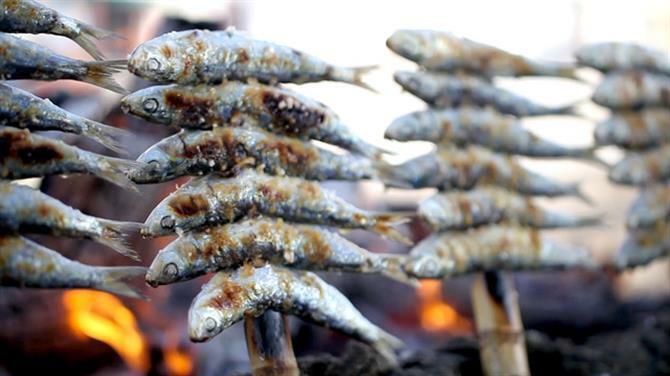 This tradition has carried through thousands of years, and today most espetos are still grilled in old fishing boats. Don Miguel Martinez Soler, more commonly known as “Miguel, el de las Sardinas” also played his part in local sardine history. Miguel was the first person to introduce King Alfonso XII to the traditional Malagueño espeto back in 1884. Cooking his sardines with a mere bamboo spit and a small open fire on the beach, Miguel is said to have insisted the King eat his sardines with his hands. Much to the amusement of the King and his entourage. A comment, that gave “Miguel, el de las Sardinas” a certain notoriety and marked his place in history. An espeto is usually made up of six sardines to a single bamboo spit. The best ones to grill are the mid-sized ones. The ice buckets the sardines are kept in, aren't just for keeping the fish fresh. The cold ‘hardens’ the meat making the skewering easier. Salt at least 30 mins before cooking. For added flavour, place branches of fresh herbs such as thyme, rosemary, bay or fennel on the embers. Espetos are cooked over a wood fire. Olive wood is traditionally used, which also adds to the flavour. Sardines pack an impressive nutritional punch. They are exceptionally high in Omega 3 and low in calories. A single serving contains 23 grams of protein and only 200 calories. They also boast impressive levels of vitamin B and iron. As sardines sit fairly low on the food chain, they contain very little mercury and PCBs, making them an ideal choice for children and pregnant women. Sardines aren't just local – they're sustainable. Sardines are a very robust species and being seasonal spawners their population bounces back regularly. One of the most picturesque villages in Andalucia is just a stone's throw from the Costa del Sol. Meet Frigiliana.